BANGI, 13 Jun, 2014 – The widespread and uncontrolled open burning of biomass in the country is increasingly jeopardising the health of millions of the people to exposure of the risk of respiratory diseases such as asthma and bronchitis. Professor Dr Mastura Mahmud from The National University of Malaysia’s (UKM) Faculty of Social Sciences and Humanities (FSSK) said the risk to health will reach critical levels caused by increasing population pressures leading to deliberate burning of secondary forests. Delivering her inaugural lecture on Transboundary Pollution – Tracking via Remote Sensing here today, Prof Mastura said transboundary haze from burning of biomass in Southeast Asia is a regional problem that regularly occurs during the burning season. Another impact of open burning on the atmosphere is climate change brought about by the emission of a variety of greenhouse and toxic gases as the result open burning and the use of aerosols. Greenhouse gas emissions threaten not only the environment but also the climate which is changing not only at the regional level but also around the world. She said that satellite remote sensing can monitor and map not just smoke and air pollution but even hot spots on a daily basis. It also collects information on the haze and fire-related aerosol activities. Prof Mastura expressed concern that pressures of life on the disadvantaged who cannot afford to use environmentally-friendly methods for combustion are complicating matters. She calls for better relationships between neighbouring countries to cooperate in overcoming problems of widespread open burning. There is need to ensure better monitoring and control of the problem by the respective authorities and their agencies which should also include providing guidance and assistance to farmers not to practise open burning and if need be to give them incentives for it. Studies of the characteristics and patterns of open burning showed the tendency of farmers to carry out open burning clustered together thereby further concentrating the fires. The climatic conditions at the Equator sometime makes its unable to accommodate the fires that are too intense and rampant because of the climatic phenomena such as land and sea breezes, weaker trade winds, hurricanes and the maritime influence of continental Southeast Asia on the spread of smoke, particularly emissions from thick peaty soil. In addition, air pollution from fine particles such as dust and gases that are harmful to health in the region in addition to greenhouse gas emissions, threaten not only the environment but also changing the climate at regional and global level. Also present at the inaugural lecture was vice-chancellor Prof Datuk Dr Noor Azlan Ghazali, who also delivered the introductory speech about Prof Mastura, deputy vice-chancellor Prof Datuk Dr Saran Kaur Gill and Dean of FSSK Prof Dr Hazita Azman. 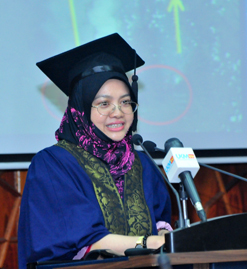 Prof Mastura graduated with a Bachelor of Meteorology and Physics at the University of Reading in the UK. Next she pursued a Masters of Applied Climatology at the University of Birmingham, and later did her PhD in Tropical Meteorology at the same institution.